Mark grew up regularly attending a Lutheran church with his parents and brothers. At age seventeen he first attended a Gospel preaching church where he witnessed the living testimony of true believers. Seeing their testimonies drew Mark to want to receive Christ. He began listening to a Gospel radio program regularly and finally came to repentance and faith in Christ and called on Christ as his Lord and Savior. As a senior in high school he met some Baptist believers. In the course of time he began attending Baptist churches and was immersed about two years after being saved. Donna is the oldest of nine children and grew up on a farm in Manitoba, Canada. Her family lived with her Grandma who truly knew and loved God. When Donna was eight years old she had the opportunity to attend Bible camp. Although most people saw her as a good little girl, she knew she was a bad liar and sinner. She turned to God from her sin and trusted what Jesus had done for her on the cross. The camp had a Bible reading and memorization program that helped her to grow spiritually and know what God wanted for her life. Her life’s verses are Proverbs 3:5&6. In 1977, God led Mark to Pillsbury Baptist Bible College to pursue a degree in Bible. There God called him to fulltime Christian service and directed him into elementary education. At Bible College Mark met Donna and they were married in 1980. Mark and Donna are blessed with four children who are all grown and married now. For 29 years Mark taught in Christian schools. Through the years both Mark and Donna have served in a full range of ministries in Independent Fundamental Baptist Churches. Mark received further Biblical training from correspondence courses and earned his Certificate of Theology from a local church Bible Institute. 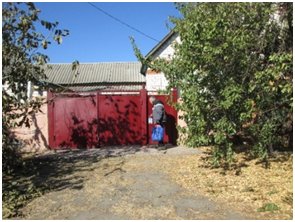 The Ukrainains have started preaching services in the village of Vvedenka. They had 8 folks for their first service and only one or two since then. The cold and snow makes for a difficult start but they are planning for summer outreach and camp. Four people from Lighthouse Baptist went along with Donna and I and sang at the train station square on Christmas Eve. We had a good reception to the tracts given out that evening. God’s provision of comfortable, convenient apartment in the city. Tickets in hand to go stateside for 12 weeks, from Feb 22-May 17. It was in our original plans to return every 14 months or so and Mark has not been back since Dec. 2, 2016. Lord willing, we will be in Virginia from mid March to mid April. If you want to contact us during this time our number is 434-264-1464 (a local VA number that we can answer over skype in Ukraine). We have two ladies who are believers that translate for us—Maryana and Katya. Unity and growth of believers at Lighthouse Baptist. Fruit from our tract ministry and wisdom as we research ways to reach people online. 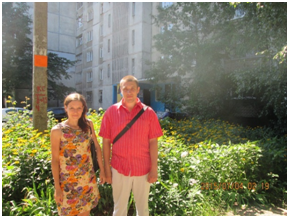 Unsaved in Vvedenka and summer outreach focusing on young people. Salvation of those in the English/Bible club—Gregory, Vasily. Salvation of Katya who translates for Donna in children’s Sunday School. Two of her children are in the class and her husband professes to be a believer. She is an atheist with a lot of questions. 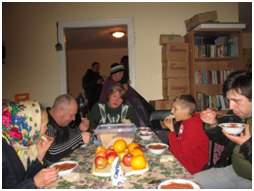 Salvation of Pasha (our former translator) and his wife Julia and 2 boys, Pasha and Elusha. Julia and young Pasha help us with our study of Russian. Continue to pray for our language learning. Our health needs—continued healing and wisdom concerning Donna’s arm. A recent x-ray showed that the small bones in the wrist are out of place which does not allow her full range of motion. --for successful treatment and healing of bone infection under two of Mark’s teeth. Plans for advertising on the metro in June. One million passengers ride the metro every day. Pray that people will read and respond to the ad. Most of the people are former alcoholics. They have a good translating with her little girl with her. and Mark at church eating lunch outside. Tanya and David at the river Meal after church—Zina, Valodian, Tamara, Vasia, Gala, ­­­­­­­­­­­­­­­­­­­­­­­­­­­­­­ Max, and Serioga. The boxes are full of literature to distribute. Our hope—Jesus Christ came into the world to save sinners. Have a Blessed Christmas as you look to HIM.